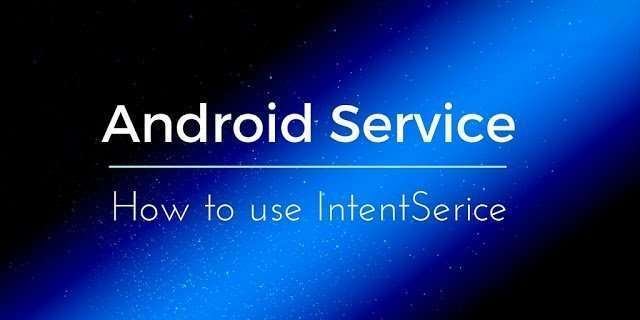 In this post, I will explain how to consume Webservice in Android using Android IntentService. We know we can consume a Webservice directly in the UI using for example Volley lib or a simple Http client, but there are some cases when we want to consume webservice in Android making an android call from an Android Service. We know that Android Service has a “longer” life than an Android Activity and if we want a task is completed even if the app UI is no longer available we should use a Service. Consider for example the download scenario: let’s suppose we have to download some information from a remote server; we could do it in the UI (i.e Activity) but if the user, for example, moves to another app the download will be interrupted. If we want to be sure that the download continues even if the app isn’t any more active we can use Service. Considering that the heavy work is made in a separate thread we don’t know when it will finish and the calling Activity is unaware of it. We will describe how to get back the information as the service retrieved data from the remote Webservice. This is an important aspect because almost all Android apps have to connect to a backend server that exposes service. They have to consume webservice in Android to retrieve data from the servers. At line 18 and 25, we implement the two methods required to marshal and unmarshal our class. If you want to have more information about Parcelable, you can give a look at this tutorial describing how to use Parcelable in Android. Another interesting aspect is how we can get the values back from the IntentService. As we, already, know the calling activity doesn’t wait for the result, so we have to find another way. Generally speaking, there are different ways to solve this problem, in this post I will explain how to use ResultReceiver. This method is quite simple and elegant in my opinion. This class is very simple. At line 19 we define an interface that the calling activity has to implement to get notified when the data is available. In this interface, we define a Bundle that holds the data retrieved. Then at line 14 we override the onReceiveResult and call our callback method defined in the previous interface. ..and here we update the UI, with the data received. At the end of this post, you hopefully gained a knowledge about how to consume webservice in Android. This is an important aspect because usually, apps have to connect to remote services to retrieve information and consuming webservice in Android is a key part of an Android app. Just a small noob question. 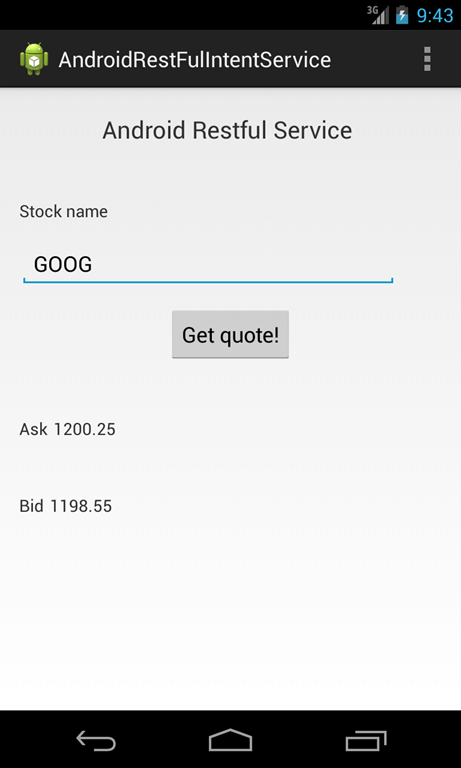 Why do you think we can not use AsyncTask to get the stock quotes from server instead of a service. I think we still get the response even when the app is minimized. Please clarify.